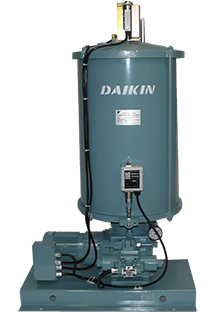 UE40 (40 MPa Motor Driven Pump) | Products | Daikin Lubrication Products & Engineering Co., Ltd. This motor driven grease pump is used in dual line systems. This pump helps to reduce lubricating system costs by supporting smaller size pipes and wider range lubrication which has resulted from the application of higher pump pressures and larger discharge quantities. Pipe connection port and replenishing port support pressures up to 40 MPa by parallel pipe thread connections. *For details on outdoor type, consult us separately. • Before pump operation, fill the crank chamber fitted into the tank bottom with lubricant (gear oil Class 2, VG220 JIS K2219 or equivalent) up to the designated oil level (approx. 5 L) marked in red. • Replace the lubricant in the crank chamber 200 hours after the start of operation and check every 2,000 hours from then on. • In this diagram, S: 1-stage low, high is indicated for the tank control system.